Far more than just a management tool set, Lean is a way of thinking – a mindset – to achieve sustainable, profitable growth. The process starts with the customer’s perception of value – what they are prepared to pay for. In Lean Thinking, any process that does not add value is defined as waste and should be reduced or eliminated. Working on the front line, employees are therefore critical to Lean techniques. Not only charged with adding value to a service or product, employees are also best placed to identify wasteful processes or activities. It is for this reason that Four Principles’ collaborative approach empowers and motivates your workforce to become a key driver in long term, sustainable improvement. 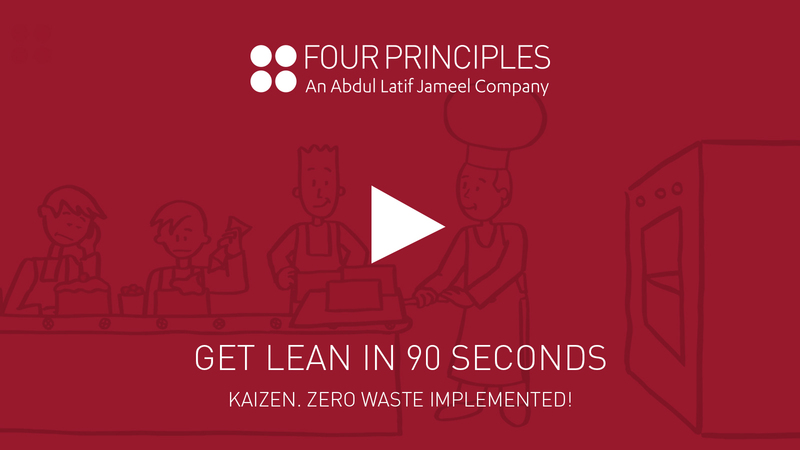 Although the term was first coined in 1988, the concept behind Lean is not a new idea. Its emergence in the industrial era was championed by the likes of Henry Ford, who introduced working practices that we would now describe as Lean. The philosophy’s theoretical narrative was advanced by management gurus W. Edward Deming and Joseph Moses Juran. However, it was Toyota’s development of Toyota Production System (TPS) as the company emerged to become a global automotive superpower, that first formalised the Lean concept and established its founding principles. “Kaizen. Zero waste implemented! 改善,ムダゼロ達成！” encapsulates Four Principles’ application of Lean Thinking and reflects our roots in Toyota’s corporate culture. Today, no matter what sector, industry or size of business, Lean techniques are recognised as the single most effective business improvement strategy to optimise supply chain management, implement zero waste and achieve long term, profitable growth. Supported by Four Principles’ uniquely collaborative approach, Lean Management principles have the power to achieve holistic and sustainable transformation of your business – a tool set and a mindset working in perfect harmony.